Basic fetch request to an API endpoint. 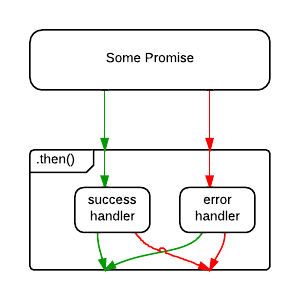 A promise is an object that represents the eventual completion (or failure) of an asynchronous operation, and its resulting value. If the promise is successful, then it determines what happens next after the event or operation. An event can be a timer finishing or data coming back from an AJAX call. It’s as if we are asking the server for some data in the background and the promise “promises” to give us the data at a certain time in the future. A promise has its own methods, which you call to tell the promise what will happen when it is successful or when it fails. The methods a promise provides are “then(…)” for when a successful result is available and “catch(…)” for when something went wrong. Every .then() should either return a new promise or just a value or object which will be passed to the next .then() in the chain. Another important thing to notice is that even though we are doing two different asynchronous requests we only have one .catch() where we handle our errors. That’s because any error that occurs in the promise chain will stop further execution and an error will end up in the next .catch() in the chain. The code that is executed when the request has finished, referring to the subsequent .then() calls, is put on the event loop just like a callback function would be. This means you cannot access any variables passed to or declared in the promise chain outside the promise. The same goes for errors thrown in the promise chain. You must also have at least one .catch() at the end of your promise chain for you to be able to handle errors that occur. If you do not have a .catch(), any errors will silently pass and fade away and you will have no idea why your promise does not behave as expected. 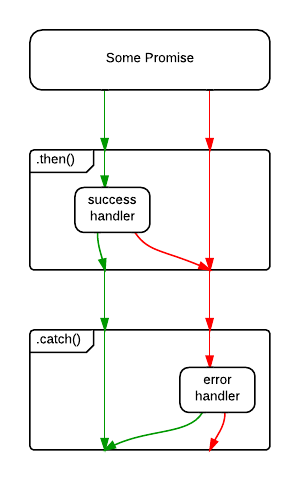 Without .catch(), an error in the success handler will go uncaught. With .catch(), both error sources are handled. When first exposed to promises/promise chains/AJAX fetches, I felt lost and bewildered. I could not understand what I was looking at or what exactly was going on in the code. But what helped was looking at many, many examples of application projects that required fetching data from an API and then using that data to do something else. Through the several iterations, it all started to become clearer what was going on and how the promises were working/doing their job. This pattern of not understanding, and then finally having that “aha” moment doesn’t happen right away and can take either a few hours to a few days depending on the complexity of the concept. It’s become a routine in my life as a student learning the ins and outs of a programming language and is something that I have come to embrace instead of fearing. There is a behemoth of information and knowledge out there to learn, but if I don’t have the right mindset going into the learning, then I will already be at a disadvantage from the get go. It is my goal to attack every knowledge gap that I have with as much effort and enthusiasm as possible! Thank you for reading and I hope you enjoyed this blog. Till next time!